Acknowledged author Kerry H. Cheever PhD RN wrote Brunner & Suddarth's Textbook of Medical-Surgical Nursing comprising 2212 pages back in 2017. Textbook and etextbook are published under ISBN 1496347994 and 9781496347992. 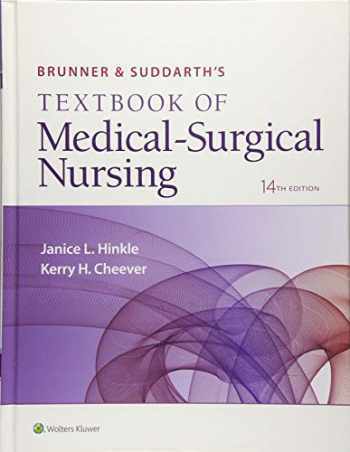 Since then Brunner & Suddarth's Textbook of Medical-Surgical Nursing textbook received total rating of 4 stars and was available to sell back to BooksRun online for the top buyback price of $64.70 or rent at the marketplace. Highly readable and rich with engaging case studies and learning tools, Brunner & Suddarth’s Textbook of Medical-Surgical Nursing, 14th Edition delivers the complete nursing foundation students need in a format designed for the way they like to learn. This approachable text is accompanied by callouts, questions, and vignettes to help students explore essential patient care practices in real-world terms and gain a more practical understanding of how they’ll apply what they’ve learned in practice.Trusted by instructors, students, and practicing nurses for more than 50 years, the 14th edition of this landmark resource has been comprehensively updated to reflect the latest research and practices and keep pace with the transition from critical care to home care, ethics, and genetics. Complete integration with Lippincott CoursePoint allows you to easily map out your entire course, provide personalized student remediation, and simulate real-world nursing scenarios based directly on vignettes in the text, giving your students unparalleled preparation for success in the medical-surgical nursing workforce. Key Features in the 14th Edition:NEW! New chapter on assessment and management of patients with obesity including expanded content on gastric and duodenal disorders.NEW! Interdisciplinary feature in every chapter. Nursing students should be educated in an environment that provides such interdisciplinary educational experiences based on mutual understanding and respect and designed to enhance the practice of each discipline.EXPANDED! Immunodeficiency chapter includes updated HIV infection and AIDS content.UPDATED! The following units have been revised Immunologic Function, Digestive and Gastrointestinal Function, and Metabolic and Endocrine Function.Concept Mastery Alerts clarify difficult concepts, informed by data from Misconception Alert questions in PrepU for Brunner & Suddarth's Textbook of Medical-Surgical Nursing , 12e.Quality and Safety Nursing Alerts build upon previous edition’s Nursing Alerts to highlight issues related to quality and safety nursing care.UPDATED! The unit openers include new Case Studies with QSEN Competency Focus to highlight a competency and related knowledge, skills, and attitudes. Additional information for these case studies related to NANDA-I, NIC, NOC and the nursing process is available online.Prioritization Questions have been added to the Critical Thinking Exercises .Genetics Charts and Ethical Dilemma Charts have been revised to reflect the latest advances in the field.Critical care information has been updated to further the authors' goal to have the most up-to-date and clinically relevant content on critical care throughout the book.The Table of Contents has been reorganized for a more logical sequence and flow.Nursing Process sections, Plans of Nursing Care , and Critical Care sectionsMore than 2,900 NCLEX-style review questionsAssessment Charts, Risk Factor Charts, Guidelines Charts , Genetics in Nursing Practice Charts, Patient Education Charts, Health Promotion Charts , Ethics and Related Issues Charts , and Pharmacology Charts and tables.Gerontologic Considerations sections, Physiology/Pathophysiology figures, and updated Home Care ChecklistsNursing Research Profiles and EBP questions help students learn the importance of evidence-based practice.Concepts in Action Animations bring anatomy, physiology and pathophysiology concepts to life.